Yes, it’s small, but was perfectly adequate for all our needs. There was plenty of storage for all our stuff, and we unpacked everything in no time. 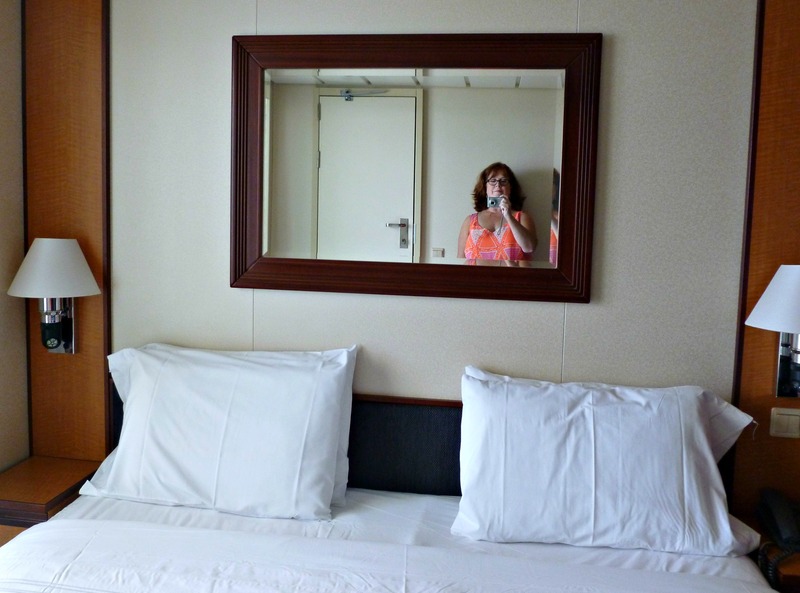 Our bed was a bit firm, but still quite comfortable. You might notice the doorway shown in the mirror below. That door connects to the adjoining cabin – but we weren’t traveling with the folks next door, so we kept it locked. Okay, so here’s the obligatory shot of the mini bathroom. 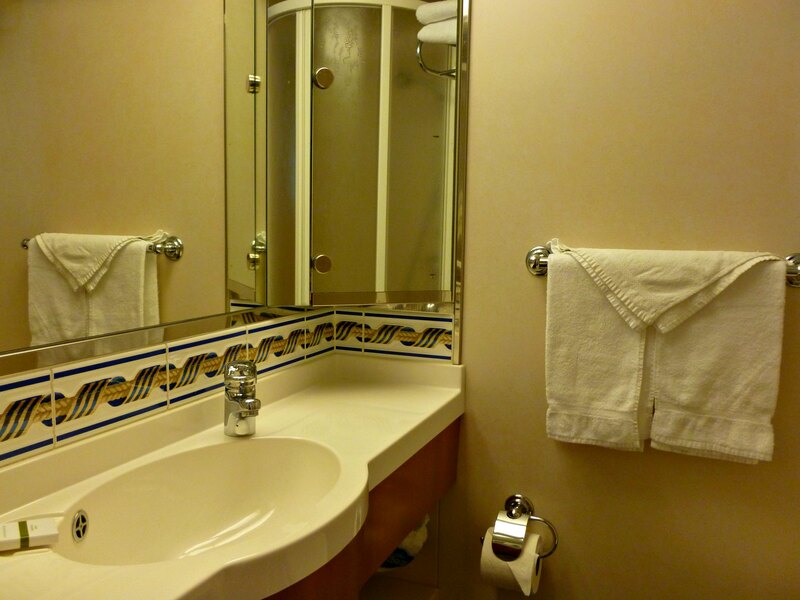 Again, it was indeed tiny, but was always kept spotlessly clean by our wonderful room attendant/cabin steward, Gobin. 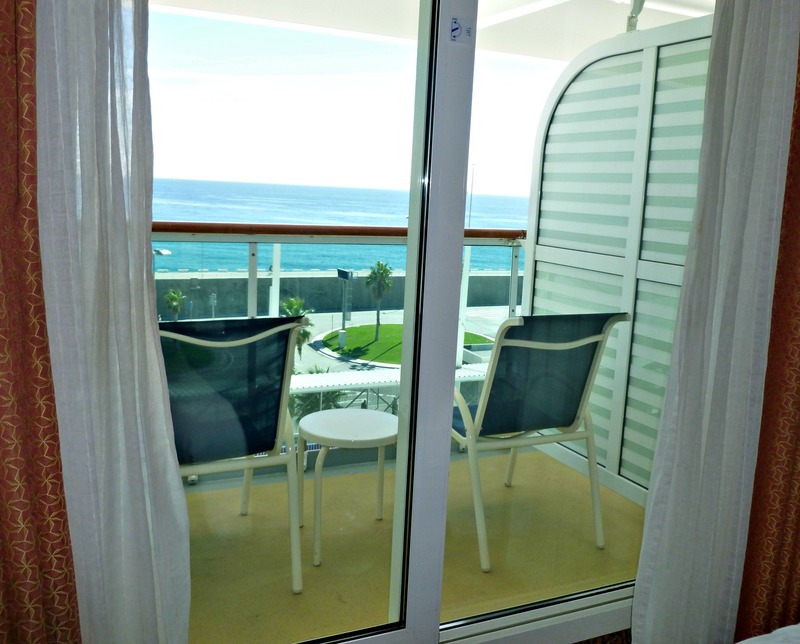 Next photo is of our lovely little balcony… or verandah as they say in the cruise ship business. 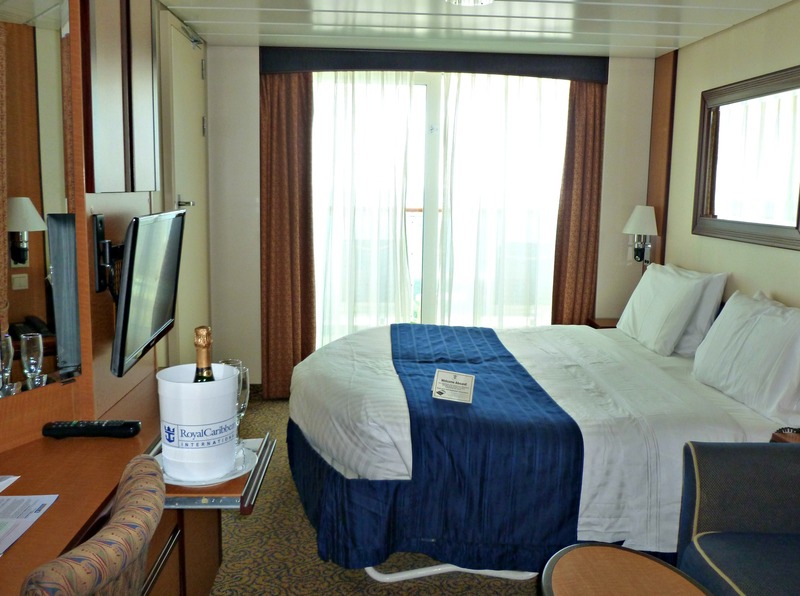 Plenty of room for two to enjoy the sights and sounds of the ocean and the ports of call. 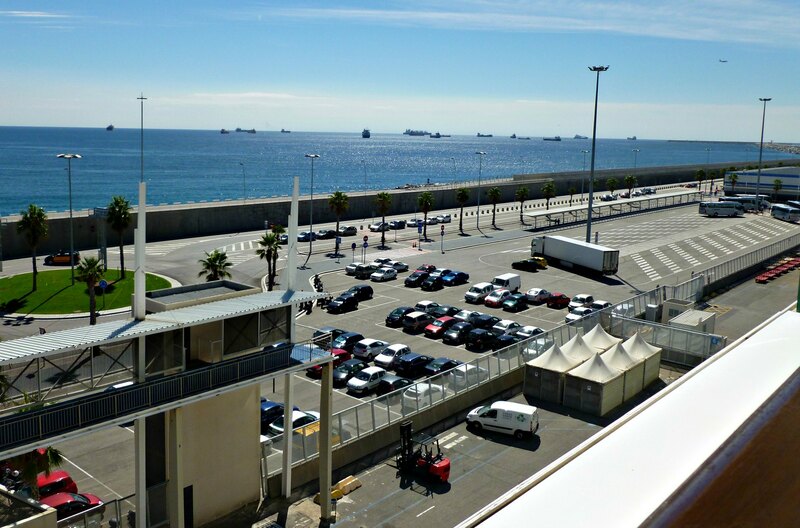 Here’s a photo of the port of Barcelona. 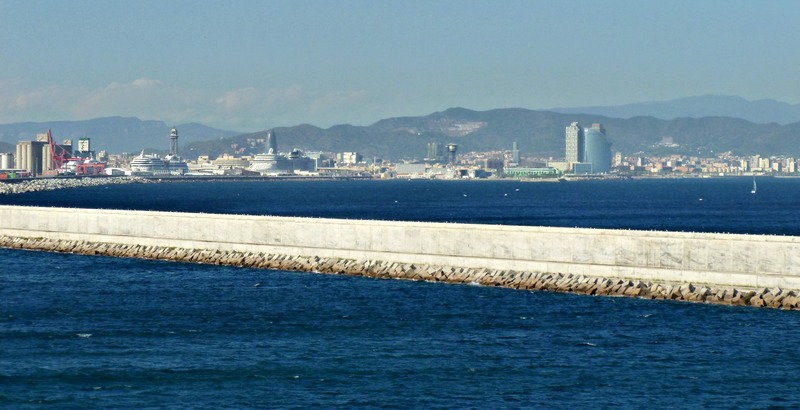 We were told that other than Florida, Barcelona has the most cruise ship traffic in the world! You can see many vessels out in the ocean. Apparently it’s a busy port for more than just cruise ships. 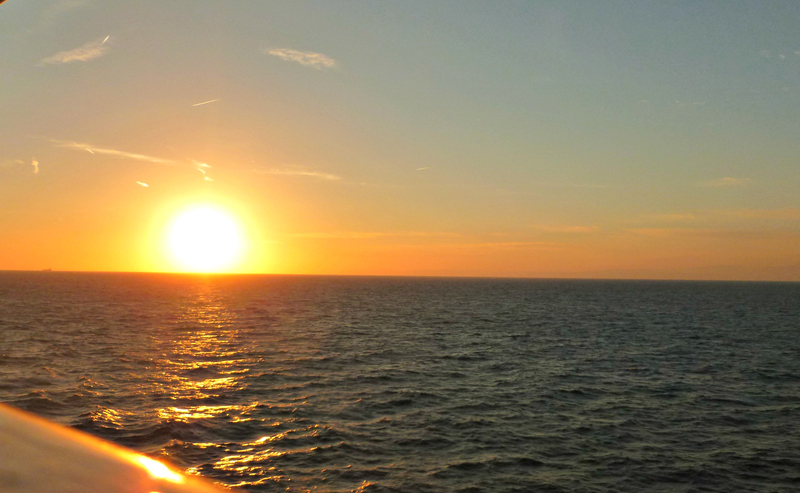 Finally it was time for “sail away”. Some folks (probably many folks) like to go up to the poolside deck and take part in the “Sail Away Party”. We decided to forego that party for our own. 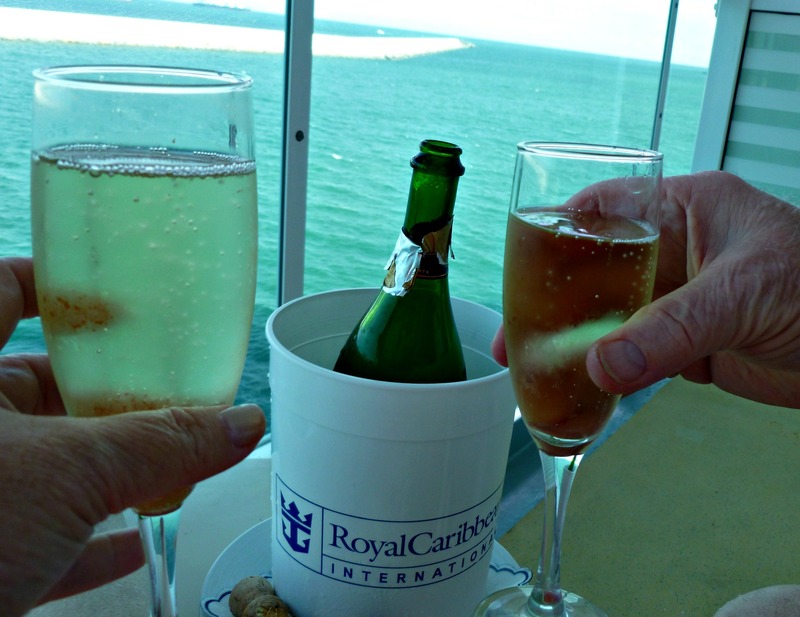 Courtesy of Royal Caribbean, we had a bottle of champagne on ice waiting for us in the cabin. We held off popping the cork until we were finally underway. CHEERS! Here’s a view looking back towards Barcelona, before we got too far out. Bye-bye, Barcelona. See you in 12 days! We were signed up for late dining (8:30pm) and joined our friends/neighbors Brian & Paul. We were all seated at a table for eight, and that first night there were indeed 8 of us. A very fun couple from Calgary Canada, Don & Deanna — and — two pleasant single girls from Puerto Rico who would not return to join us another evening. We found out that they were hoping to be seated at a Spanish speaking table. Oh well. Our table for six had a lively time every evening! This was one of a few nights that I failed to take photos of our dinner. After dinner we decided to retire and get ready for the next day, our eagerly awaited port of call in Cannes, France. We would be doing an excursion to Monte Carlo! Okay, I realize this next picture is not great quality, but it’s all I have of the disappointing day that was Day Two on our cruise. 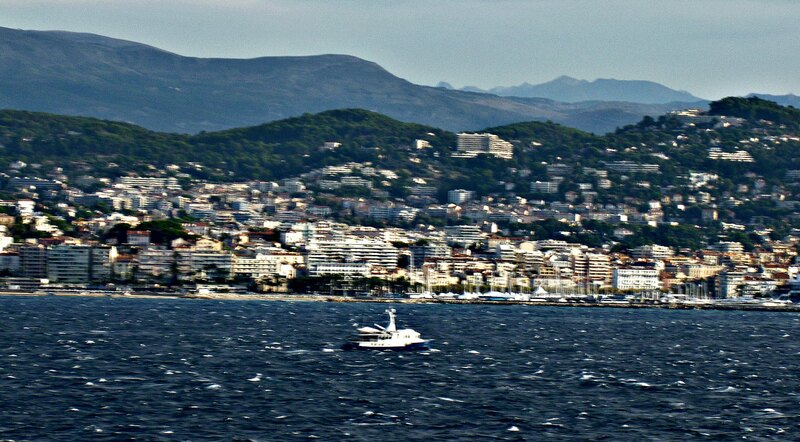 Because of very high winds, the captain made the decision to NOT tender at Cannes. We do understand that it could have been a serious safety issue. The logic in our minds did not assuage the pain of having to miss Monte Carlo. Heck, we’d watched “To Catch a Thief” – the 1955 movie starring Princess Grace and Cary Grant, set in Monte Carlo. We’d planned to enter the grand Casino. Hubby was very interested in seeing the streets where the famed Grand Prix car race is held. Alas, it was not to be. Instead, we got an extra “sea day” which was okay I guess, but honestly it was a huge disappointment for us. I had to refer to my daily diary to remember what we did that day. “We lay by the pool on loungers and read… I took a couple of naps” was one entry. “We went to the Crown & Castle Pub and very nearly won the general knowledge trivia contest” was another entry. When dinner rolled around it was our first “formal night”. 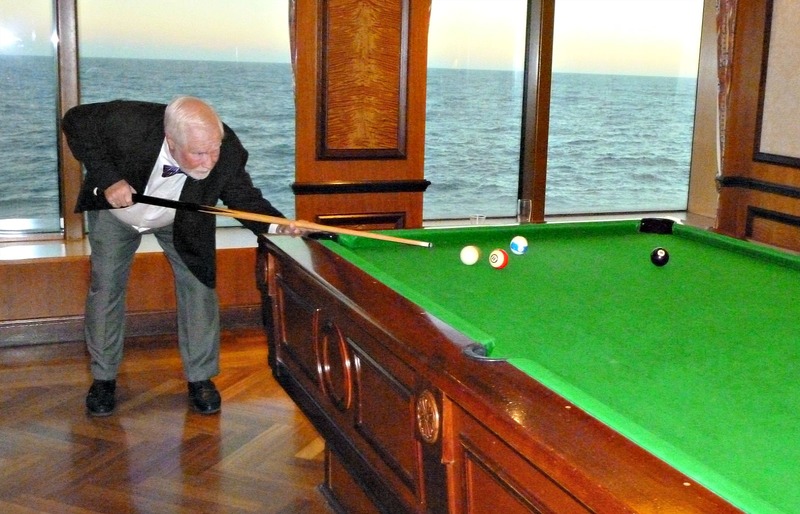 Of course I’ve failed to get any photos of us together, but I did get one of John, trying his luck at the “self-adjusting” pool tables in the Safari Lounge. I was wearing a kind of cute pink and white polka dot dress that evening… oh well. I believe B & P took some photos of us with their camera, so at some point I will get a copy. Just for the record, my husband HATES dressing up. He was a good sport for the cruise and jazzed up a bit for each of the the three formal nights. 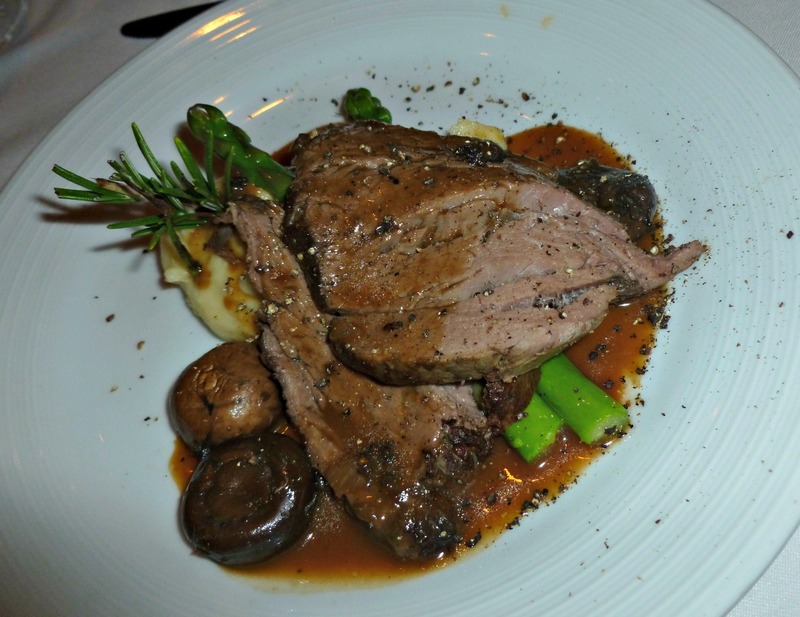 For dinner I had Prime Rib (pictured below) and John had scallops. Guess I didn’t take a shot of John’s dinner as I see no scallops in my photo library! 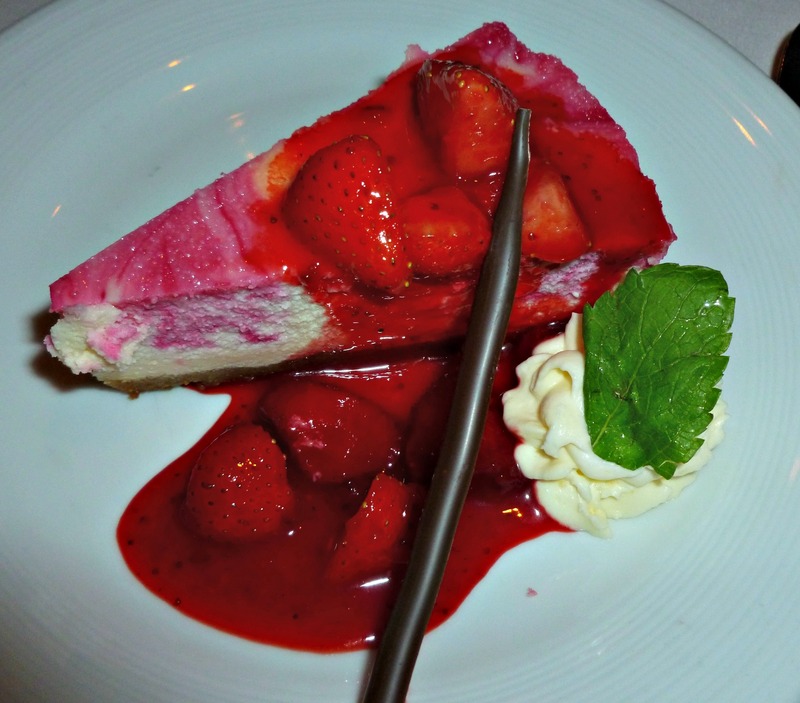 It was quite tasty, and then for dessert I had what appears to be strawberry cheesecake. If my memory serves me right, this was one of the best desserts all trip. Yum! John, who is not a dessert lover, had the “cheese plate”. Okay, Whatever. I guess the cheese for dessert is a bit of a Brit thing. Soon, we were headed back to our cabin for a good night’s sleep. Tomorrow would be our amended FIRST port of call. Pisa. Time to finally see the Leaning Tower! 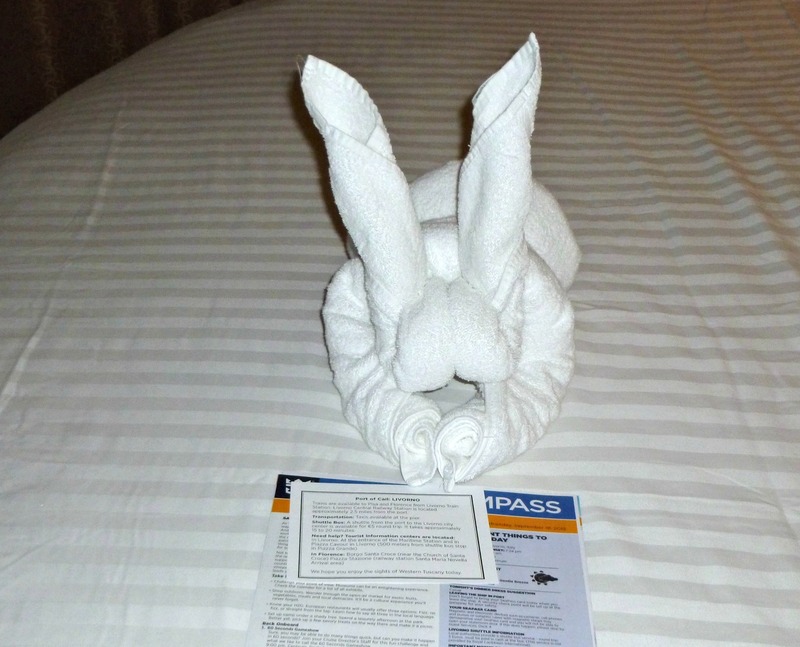 We were greeted by this towel bunny when we arrived back at #8054. Would the tower still be leaning? How would the excursion go? How would the “bad leg” hold up? Stay tuned!! How very disappointing to have missed Cannes and Monte Carlo. I sure would have been spitting chips! I have a French pen-pal who lives not far from Cannes and if that had been me on that cruise we would have arranged to meet for whatever the briefest moment……….how disappoint that would have been not to have landed. Well you will just have to go back to that area of France another time! !